I’m always looking to put a new spin on the beloved pizza. I like to load them up with veggies and make a nutritious pesto or bean puree as the base to build from. Start with the simple homemade whole wheat pizza dough or pick up a good quality pre-made dough. Once the dough is ready to go, this meal comes together quickly and is a great weeknight dinner. 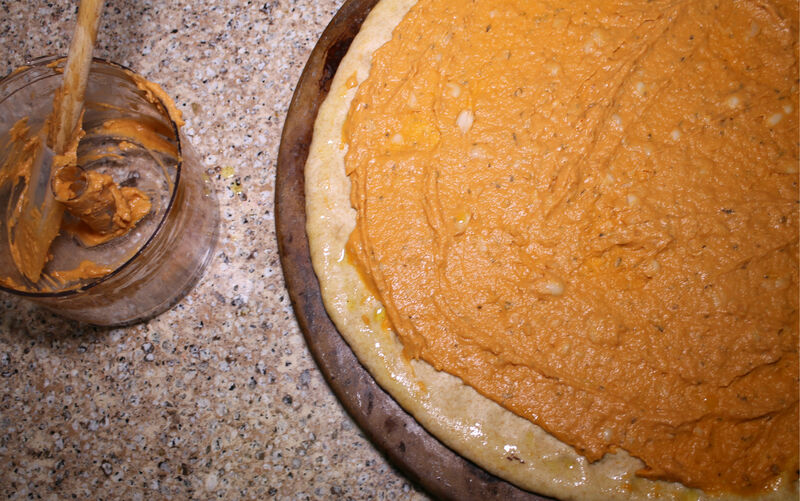 My Greek veggie pizza starts with a wholesome puree of cannellini beans, tomato paste and herb infused olive oil. 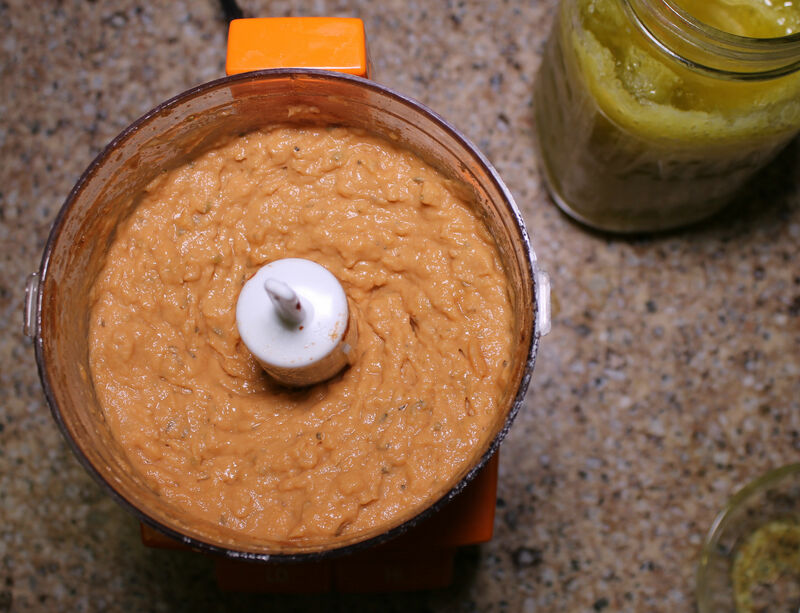 The bean puree will stand in for the traditional tomato sauce to add flavor and bump up the protein content. I keep a variety of herb infused olive oils on hand to flavor and finish dishes. You can purchase them at retail stores or you can easily make them at home. These oils keep well in the refrigerator or the freezer for longer storage. If you would like to try making some, check out this great explanation of making a variety of infused oils. On top of the bean puree, I piled sliced zucchini, diced onions, grape tomatoes and fresh spinach. This pizza is topped with Kalamata olives, capers and crumbled Greek Feta to finish it off. 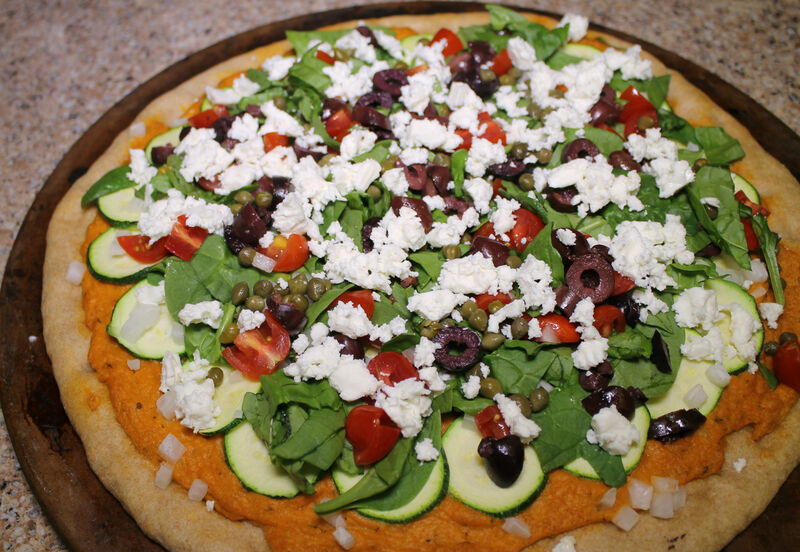 It is a filling and nutritious pizza to serve your family or friends! For assembly, the pizza is baked in two steps to allow for the raw zucchini and onions to par-bake. First, the dough topped with the bean puree, zucchini and onion is baked for approximately 7 or 8 minutes. Next, the remaining vegetables are added. The fresh spinach and tomatoes will cook quickly so no need to cook them ahead. 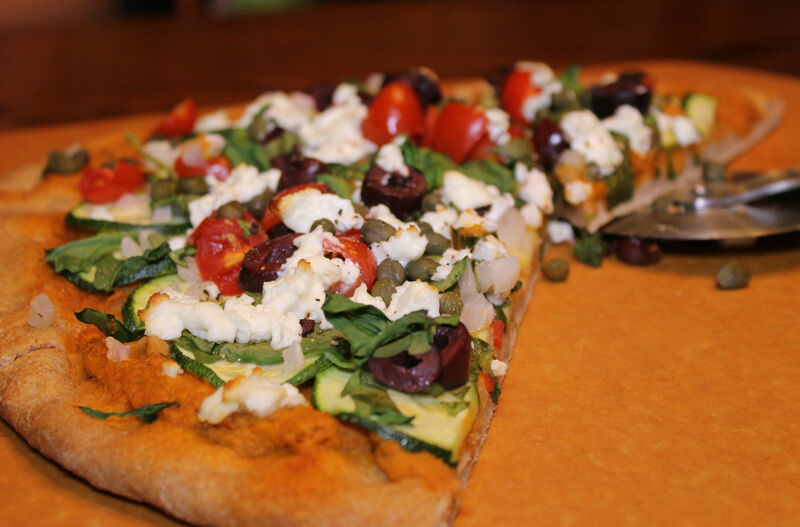 Capers, kalamata olives and feta liven the pizza up a bit and round out the flavors. If you would like to make homemade pizza dough, try the recipe below. It can easily be doubled and the extra dough frozen for a future use. The dough comes together in less than 10 minutes and needs to proof for just 1 hour before use. If you are using a previously made frozen dough, simply remove it from the freezer early in the day and allow it to sit out for roughly 6 hours in a covered bowl before proceeding. Simple pizza dough that comes together quickly and bakes into a chewy and crisp crust! Add the yeast and sugar into the warm water and set aside for 5 minutes. Mixture should become bubbly and frothy if yeast is live and activated. Combine flour, salt and olive oil in mixing bowl. Add the water mixture into the dry ingredients and mix on low for 2-3 minutes or until ingredients combine into a uniform ball of dough. 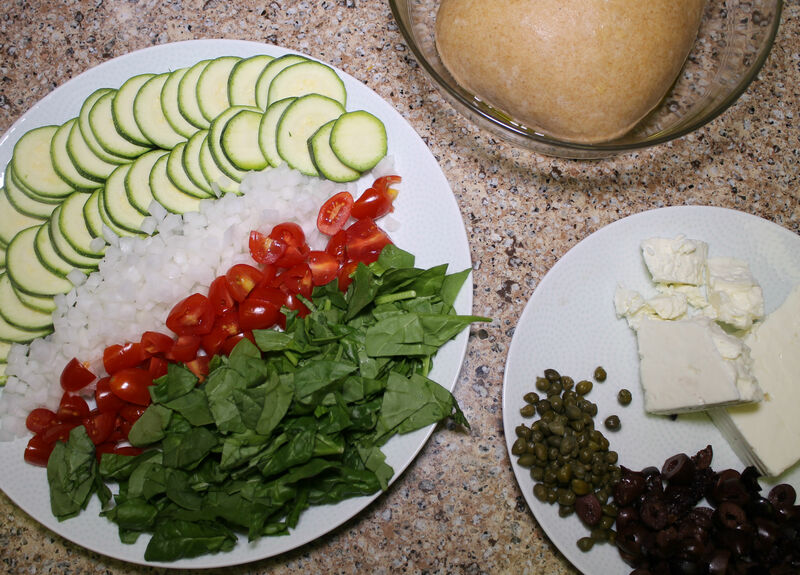 Pour a dash of olive oil into a clean medium sized bowl and onto the dough itself. 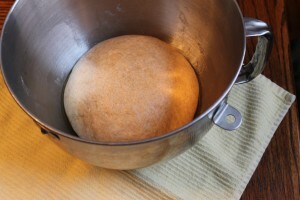 Coat the dough and place in the bowl and cover. Set in a warm place for 60 minutes to rise. If you wish to use regular bread flour or all purpose flour you can. The bread flour provides added gluten to the dough but you can also use a standard AP flour and still end up with a delicious dough. 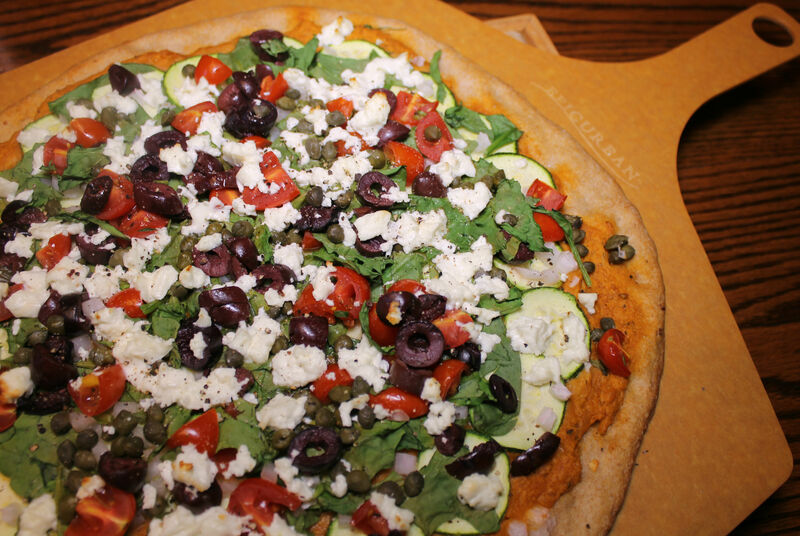 Whole wheat pizza topped with a cannellini bean puree, fresh veggies and crumbled Greek Feta. In a food processor, combine the beans, tomato paste, herb oil, water, garlic powder, dried herb blend, salt and pepper. Puree until mix is fairly smooth. Set aside. Using your hands or a rolling pin, work the dough into a 13-14"circle and place on a baking stone or greased baking sheet. Spread the bean puree on top in an even layer. 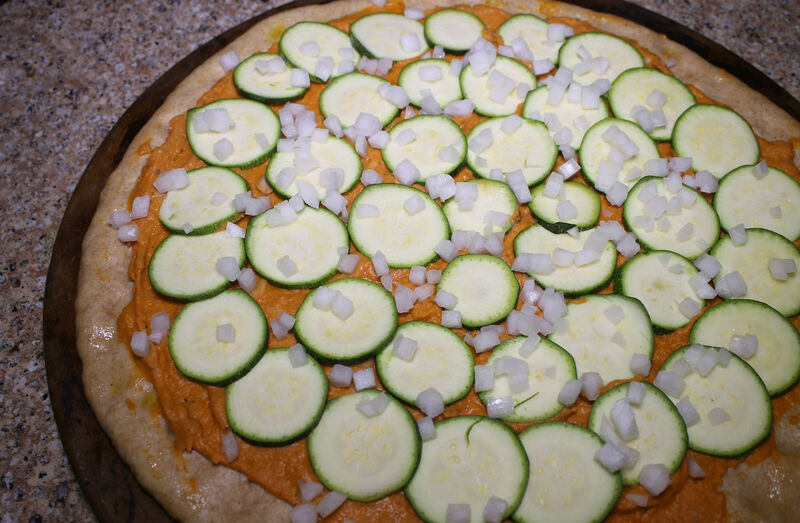 Arrange the sliced zucchini rounds on top of the pizza and sprinkle the diced onion around. Bake for 8 minutes. * If you do not have an Italian or Mediterranean Herb blend, use any one of those dried herbs listed in place of the blend. ** A mandoline works great for slicing the zucchini into uniform rounds. Always use a mandoline with caution.